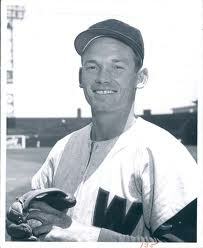 Lloyd Hittle, former pitcher for the Washington Senators, died March 3, 2012 in Lodi, Calif. He was 88. Born February 21st, 1924 in Acampo, Hittle entered professional baseball with the Stockton Ports in 1946 upon returning from his service in World War II. In 2008, Hittle’s wife Bernice, who was assisting her husband with a phone interview due to his hearing loss, told his story of signing a professional contract. After posting a 4-2 record during his 1946 rookie season, 1947 would be a memorable year for Hittle on many levels. Before the season started, Hittle took a great leap of faith that would pay dividends more than 60 years later. With his newly-minted wife by his side, Hittle pitched brilliantly for Stockton in 1947 winning 20 games, earning a late season call-up all the way to AAA Oakland from Class C. He was quickly on his way to the major leagues. Following a 17-win season at Class B Bremerton in 1948, Hittle received the call from the Washington Senators to the big leagues halfway through the 1949 season. After a rough debut against the Detroit Tigers on June 12th where he walked seven batters in 6 1/3rd innings, Hittle settled down in his next nine games, surrendering only five runs in 22 2/3rds innings, including his first victory against the New York Yankees at Yankee Stadium. Hittle pitched in 36 games for the Senators in 1949 and another 11 for them in 1950, finishing his major league career with a combined 7-11 record. Hittle’s career however, didn’t end after 1950, as he pitched another five seasons in the Pacific Coast League with the Oakland Oaks and Hollywood Stars. While pitching in the PCL, Hittle was witness to two of the most infamous brawls in league history. On July 27, 1952 in San Francisco, Oaks’ African-American catcher Piper Davis went after Seals’ pitcher Bill Boemler after he was drilled twice earlier in the game. A fight of epic proportions ensued, spilling over into the stands, nearly inciting a riot. Hittle’s wife remembered Oakland’s Cuban catcher Ray Noble being so incensed during the melee, that he was engaging hecklers in the crowd. On August 2nd, 1953, Hittle was pitching for the Hollywood Stars, when Stars outfielder Ted Beard spiked Los Angeles Angels third baseman Frank Kelleher setting off a donnybrook so wild that fifty police officers were called onto the field to restore order. Hittle’s wife was once again present to witness the chaos. In 1954, Hittle walked away from professional baseball, but not the game completely. “At 30 he decided it was time to quit. He played semi-pro for a number of years, until he was 40 years old when he quit playing all baseball,” said Mrs. Hittle. Eventually, it became too cumbersome for Hittle to manage his work responsibilities for Pacific Telephone, while continuing to pitch. Hittle worked for Pacific for thirty years before retiring. In the early 2000s, Hittle survived both prostate and bladder cancer, and despite his physical problems, he was a fan favorite at the annual Stockton Ports Alumni games, throwing out the first pitch and gladly signing autographs for fans. Mrs. Hittle, who was generous in helping not only to relay the memories of her husband, but those of a baseball wife during our interview, shared how partnering in his journey transformed her skepticism about the lives of baseball players.